Posted on December 20, 2016 by admin wrote in News. Salesforce.com is in a “phenomenal position,” according to a Wall Street analyst that initiated coverage this week. Salesforce’s shares have dipped nearly 11 percent so far this year, as the company’s mergers and acquisitions activity generated a flurry of headlines. In addition to a hefty acquisition of Demandware, vocal CEO Marc Benioff also briefly eyed deals with LinkedIn and Twitter. 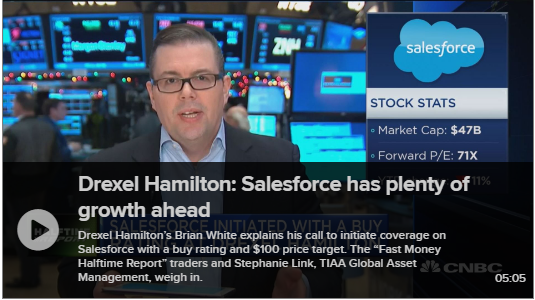 Drexel Hamilton analyst Brian White told CNBC’s “Fast Money: Halftime Report” on Tuesday that he sees upside to the stock, in part because the company is smart about knowing when to build technologies versus when to buy. To be sure, not everyone agrees, especially when it comes to Benioff’s desire to tie-up with Twitter. White initiated coverage of the cloud software company this week with a $100 price target, a hair above the $95.24 consensus of analysts surveyed by FactSet. Salesforce is still a relatively new player for enterprise technology in the burgeoning cloud space, White wrote in a research note.